Are you a college student looking to make some money this summer? A teenager saving up money for your first car? Or do you just want a seasonal side hustle that can bring in the big bucks? Sure, you can make some pocket money working at the mall or scooping ice cream at your local ice cream shop. But those jobs will barely pay for the gas it takes to drive there. 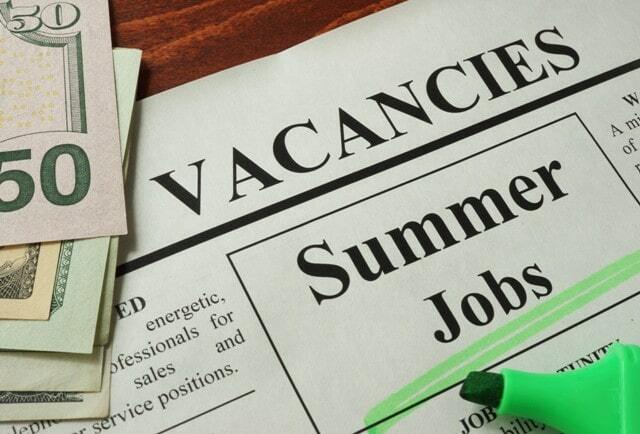 Make the most of the short summer months by getting one of the highest paying summer jobs out there. But if you want to make some serious money, check out these 8 summer jobs that pay well. With 23.8 million golfers and almost 20,000 golf facilities in the United States alone, there are ample job opportunities for caddies. Summer is one of the most popular times for golfing as well, especially in areas that prevent golfers from getting their Tee Times during the snowy, wet winter months. Most of these jobs are going to be at fancy country club golf courses, which means there's plenty of money to pay the caddies well. You do need to know the difference between golf clubs and have the ability to be on your feet carrying a heavy bag in the sun all day. But if you meet those qualifications, you can make a cool 30 dollars per hour. Not too shabby! National Parks get over 330 million visitors each year, with visits peaking during the spring and summer months. They offer a wide range of seasonal opportunities with everything from running tours, cleaning, conservation efforts, scientific research, and more. These jobs can pay anywhere between 14 and 18 dollars per hour, which is well above the national minimum wage. What summer is complete without a trip to the pool, lake, or beach? These places can't operate without qualified lifeguards. It's not easy to become a lifeguard, though. If you thought learning all of the types of golf clubs was hard, you won't be excited to learn that to become a lifeguard you'll need to become a certified lifeguard. This means taking CPR classes, passing written and practical exams, and proving that you're a great swimmer. You can read more about what it takes to be a lifeguard on this post by Lifeguard.Careers. If you can get through all that, you'll be paid well for all your efforts. How well? Pool jobs pay around 10 dollars an hour, but this number jumps up significantly (to about 20 dollars an hour) if you can get a job at a beach, water park, or lake. Just because school is out doesn't mean that people stop studying. Between summer college classes, SAT prep courses, summer school attendees, and more, tutoring is big business during the summer. Play to your strengths and find kids (or adults!) who need tutoring over the summer. If you have experience in a certain subject or a degree in a certain field, you can make 60 dollars per hour! Even if you don't have a degree or a ton of experience, you can still expect to make at least 20 dollars per hour as a tutor. If you can't find people to tutor in person, look into online tutoring. You probably won't make as much, but it will be easier to find clients and you won't have to leave the comfort of your air-conditioned room! Youth and adult sports are huge in the summer! With soccer, baseball, frisbee, swimming, lacrosse, and every other sport you can think of loving the warm weather (well, except perhaps skiing), you'll have ample opportunity to become a ref for your favorite one! You will need to know the game well, so pick a sport you've either played yourself or have a lot of experience watching. The pay will depend on the sport and the level being played (you'll probably make more as a ref for a 16U baseball team vs a 5-year-old tee-ball league). But to give you a ballpark (no pun intended), umpires can make 20-30 dollars per hour for youth baseball games. Landscaping is perfect if you like to work with your hands and be active in your job. And active you'll be: lugging around sacks of dirt, hunching over planting trees and flowers, and mowing lawns all while in the hot sun (or pouring rain on some days!). This hard work and manual labor will pay off with an average pay of over 12 dollars per hour and with some companies offering upwards of 19 per hour! With the kids out of school, parents need help taking care of the kids. Depending on the age of the kids, how many you watch, and what other duties you're responsible for (cooking, cleaning up, bringing the kids places, taking them on outings, etc), you can charge anywhere between 13 to 25 dollars per hour. What summer is complete without summer camp! You might've thought you spent your last summer at camp years ago, but don't count out a job as a camp counselor. Overnight camp counselors can make a pretty penny this summer: you can make 15 dollars per hour and get a free place to stay. You'll also get to take part in fun summer camp activities; it's a win-win! 8 of the Highest Paying Summer Jobs: Ready to Apply? These are 8 of the highest paying summer jobs out there, but this list is far from an exhaustive one. There are plenty of other high-paying options out there. Curious to learn about some other job opportunities perfect for young people? Check out this article on some of the top business ideas for recent graduates and young millennials.